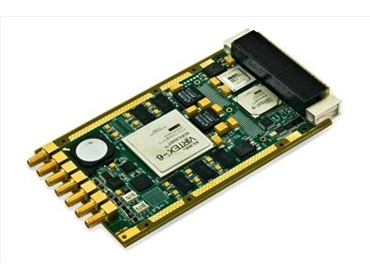 The new SPR870A 3U VPX wideband digital receiver/exciter modules introduced by GE Intelligent Platforms are designed for deployment in harsh environments for real-time processing in radar, ISR and various high performance applications. Building on GE’s industry-leading digital receiver families and extending the growing ecosystem of GE 3U VPX solutions, the SPR870A 3U VPX wideband digital receiver/exciter modules feature Xilinx Virtex-6 FPGA technology to enable deployment in wideband signal acquisition and conversion applications such as radar ECM (electronic counter measures), pulse intercept and analysis (ELINT) and RF testing. The SPR870A is ideal for sophisticated ECM applications such as spoofing hostile radar or for jamming remote control IED signals, enabling bombs to be defused more safely. According to Rob McKeel, President, Military & Aerospace Embedded Computing, GE Intelligent Platforms, the SPR870A’s performance and wide bandwidth make it far more capable than typical software defined radio platforms, while offering significant flexibility in the breadth of applications. He adds that the SPR870A can make a significant contribution to troop safety. Unlike legacy systems, the SPR870A 3U VPX wideband digital receiver/exciter modules measure key transmitter identification parameters such as instantaneous frequency and modulation rate using DSP techniques rather than analogue circuits, making them faster, more accurate and more flexible.